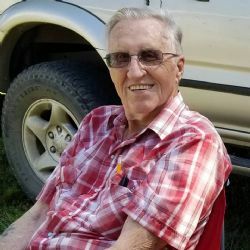 Charles Hillard Hendricks, age 85, of Acorn, Arkansas, died Saturday, June 30, 2018 at home. He was born on Friday, August 5, 1932 to Sidney Hillard and Lethea Vivian Barnett Hendricks in Plain Dealing, Louisiana. Charles was an open book and always told it like it is. He was a member of the Cove First Baptist Church and read the bible through and through. Charles served in the United States Air Force during the Korean Conflict eventually becoming the youngest instructor in the Air Force Technical Training School. He was self employed running the Century Communication Company in Tampa, Florida from 1965 to 1980 when he moved to Mena. Charles was passionate about his work and very knowledgeable in residential and business phone systems. In 1998 he started wiring all the houses that his son in law, Spike Phillis, built. Charles was a member of the Elks Club, and he liked to hunt and fish in his free time. He always enjoyed his work immensely, and loved his family even more. Charles was a loving husband, father, grandfather, brother and a great friend who will be missed by all who knew him. He is preceded in death by his parents; his first wife, Clara Virginia Hendricks; one son, Charles Wayne Hendricks; one daughter, Kelli Lynn Scott; three brothers, Carlton Hendricks, James Hendricks, and Don Hendricks; and four sisters, Ruby Speights, Georgie Stewart, Mary McLendon, and Inez Hendricks and his son in law, Spike Phillis. Charles is survived by his wife, Inez Hendricks of Acorn; three daughters, Debi Hendricks of Cove, Donna Golliher of Sarasota, Florida, Rhonda Carrier of El Dorado, Arkansas; one brother, Kenneth Hendricks of Bakersfield, California; six grandchildren, Krisi Dixon of Cove, Amber Hendricks of Mena, Lane Hendricks of Lake Charles, Louisiana , and Joe Scott of Carrollton, Texas, Corey and Caleb Carrier; twelve great grandchildren, Kadi, Mia and Laci Dixon, Laila Billings, Kavon and Trinity Vincent, Hayden Hendricks, Mackenzie Brown, Rowan, Grayson, Patton and Lily Scott; two special grandsons, Josh Davidson and Tony Davis; several nieces and nephews and a host of other relatives and friends. Funeral services will be held Thursday, July 5, 2018 at 2:00 P.M. at the Cove First Baptist Church with Brother Ron Ladd officiating. Interment will follow in the Pleasant Grove Cemetery in Cove, Arkansas. Visitation will be Thursday, July 5, 2018, from 12-2 P.M. the date of the funeral at the church. Arrangements are entrusted to Bowser Family Funeral Home in Mena.